One of the most effective ways to exterminate mice is mouse poison. This method of removal has been one of the best, and it’s been around for many years. After all these years, it still proves to be super effective—when it is used correctly and with caution. If you use it incorrectly and uninformed of the risks, mistakes are often made; and these mistakes can potentially be fatal. Get to know this weapons of mice warfare before you use it to avoid making these mistakes. It is said that the first step to solving a problem is, admitting that you have one. Do you have a mouse problem? Have you seen enough signs of mouse activity to know that your home is becoming infested with a bunch of these unwanted little creatures? Do you think there are enough mice in the home to justify using this solution that is often only considered as a last resort? If your answer is no to the 2nd and 3rd question and you are certain you only have one or two mice in the house, then this might not be the best solution just yet. It’s a little too extreme of a solution to use for just one or two stray visitors. You may want to consider traps first for the couple who are just starting to visit more than once. If your answer is yes to all of the questions above, you must find a solution, and quickly, to rid your house of them. Mice are a very concerning problem for many reasons. The Center for Disease Control says that mice can carry diseases, such as rabies, carry bacteria in their fur and spread lice and mites to you and your family. While prevention and removal is pretty simple, it is extremely important that you waste no time. In order to choose, and use a mouse poison safely, you should be familiar with the different types and how they work. This way you are able to make an informed decision. Anticoagulants- Uses Warfarin, Hydroxycoumadin, Bromadiolone, Bromifacoum to block Vitamin K production. Experts say that Warfarin and Hydroxycoumadin must be ingested several times, but Bromadiolone and Bromifacoum products are stronger. Hypercalcemia-Uses a high dose of vitamins to kill the mice. When a mouse eats food his body produces extra calcium. Eventually the amount of calcium starts to affect the organs, which causes the mouse to die. You should know that this can take up to a week to kill the mouse after ingestion. 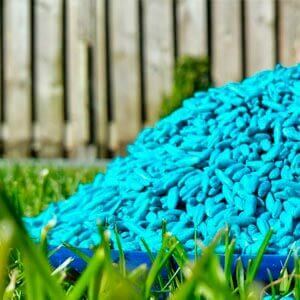 Depending on the location of your mouse problem, you will have to decide which type you will need to use (larger blocks for outdoor, or small pellets for indoor). While both of these options are extremely effective, they are easily misused and do cause safety hazards for pets and children. We need to discuss safety, and simple ways to keep your family safe. First, make sure what you are planning to use for mice is not accessible to children or pets. This is a common mistake that is made, and it can be fatal. Place them in hard to reach areas; out of reach from children and pets. If the area is less frequented by people and pets, they are less likely to see the poison. An area that is less frequented by people is likely to be more preferred by mice. They are shy little creatures after all. Placing poison for mice behind, or under furniture will prevent your child or pet from accidentally ingesting it since it will be a bit harder to get to. The second safety tip is, use tamper-resistant mouse bait stations. These little contraptions will make it much harder for children to get into. The bait is made to smell good to mice, and unfortunately, it can sometimes smell good to the kids as well as our pets. Peanut butter and fish oil are sometimes used to lure the mice in, so those will smell like food to pets. Little blue pellets also look like candy to small children, so they are likely to try to eat it. Obviously this can be fatal, so use the tamper-resistant stations to keep them inaccessible. These stations are set up just as other pest control packs; the toxin is inside of a small, plastic container. Mice smell the bait and go inside of the container, where they will find the poison. It’s contained inside of the container so that it does not come out. Unless your child or pet chews on the plastic container itself, they are fairly safe. Of course, you’ll still want to keep out of reach. If you’re not certain you can keep them away from the curiosity of small children and pets, I highly recommend you consider using mice traps instead. After the mouse is dead, there are additional precautions that need to be taken to ensure the mouse is not eaten by other animals. As I already mentioned, if you are using Zinc based poison, secondary poisoning is unlikely; which might make it the best option if you have pets that might potentially eat the dead mice. However, that is not the case with anticoagulants or hypercalcemia. If your pet or other animals eat these mice, they will be affected as well. First and foremost, USE GLOVES! Spray the mouse and the area around it with bleach. Sweeping first will stir up dust. Place the sprayed mouse inside a Ziploc bag. Place the bag inside a second bag before throwing it all in the trash. Clean the area once more with bleach. Taking these steps when disposing of the mouse will make a difference. Please DO NOT toss the mouse in the backyard or the woods. Other animals will find it, eat it, and become sick or die as well. Poison is a sure fire way to solve any mouse problem that you may have. However, experts suggest trying traps and repellents first and I agree with them. There can be unforeseen dangers that will have dire effects on pets and children. Not to mention some mice will end up dying in places that are nearly impossible to reach without taking things apart. If you’ve decided that this option is for you, the best mouse poison is actually any that you can buy (when then take caution and take a few minutes to educate yourself about them first). Place them out of the reach of children and pets. Invest in tamper-resistant mouse bait stations. Spending the extra money will help ensure that they are not accessed by anything other than the mice. Finally, dispose of the mouse properly. They can be sickening or fatal to any other animal that eats them.